Do you have loose or painful dentures? Do you have failing teeth? Do you lack confidence in social situations because of your teeth? Do your teeth make you look older than you really are? Then dental implants may be the solution for you. Working with some of North Florida’s best restorative dentists, Dr. Cherry can replace missing teeth or stabilize bothersome dentures. Dental implant solutions allow for a more youthful appearance and an enhanced quality of life that comes with being able to eat again with confidence. Visit our Jacksonville office. •Replace one or more missing teeth without affecting adjacent teeth. •Resolve joint pain or bite problems caused by teeth shifting into a missing tooth space. •Restore a patient’s confident smile. •Restore chewing, speech, and digestion. •Restore or enhance facial tissue support. 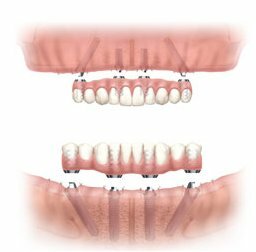 •Stabilize a bridge or denture, making them more secure and comfortable. Many tooth replacement options not using dental implants only replace the missing tooth, but neglect the importance of the tooth root. Without proper stimulation from the tooth root, the jaw bone beneath the missing tooth space begins to deteriorate causing the gums to recede adversely affecting the look of the final restoration. Aside from restoring your chewing capability one of the greatest benefits of having a dental implant procedure performed is that it replaces both your missing tooth and supports the bone enhancing your smile. • Dental Implant – This part of the restoration resembles a tiny screw. The dental implant is made of titanium so it can integrate with your jaw bone through a process called osseointegration. During the dental implant procedure, the dental implant is first surgically placed and is then usually allowed several months to heal before the dental implant abutment and crown is attached. • Implant Abutment – After the dental implant has fused with the jaw bone, our Jacksonville dental implant restorative dentist will attach a custom abutment to the implant. The abutment is a small metal extension that allows the dental implant to be accessed through the gum tissue. • Implant Restoration – The implant restoration is the crown or restoration that attaches to the abutment on the dental implant. The restoration is usually made of porcelain or zirconium and is formed to match the color and shape of your surrounding teeth. Patients that are missing multiple teeth can choose to have an implant-supported dental bridge or hybrid denture instead of multiple dental implant crowns. We understand that cost is an important factor when it comes to any dental procedure. The cost of dental implants depends on several factors including the number of teeth being replaced and the number of dental implants required to support your replacement teeth. Additionally, some procedures may be necessary before placement to ensure the longevity of your dental implants. If you wish to obtain an estimate specific to your case, it’s best to have Dr. Cherry perform an examination and discuss treatment goals. Using the latest technology, such as digital x-rays and an in-house CAT scanner, we are able to provide you with the best care possible. With over 25 years of experience in Oral and Maxillofacial Surgery, Dr. Cherry will provide you with the personalized and gentle treatment you deserve. If you would like to show off your smile again, dental implant services may be the right option for you. Our friendly staff is committed to ensuring that our patients are relaxed and comfortable during each and every visit with us. We encourage you to learn more about our oral care services. Please contact our Jacksonville dentist office for more information on dental implants or to schedule an appointment for a consultation. Please visit our Smile Gallery to view some of our amazing results.